This statue of Veronica represents the traditional 6th station. 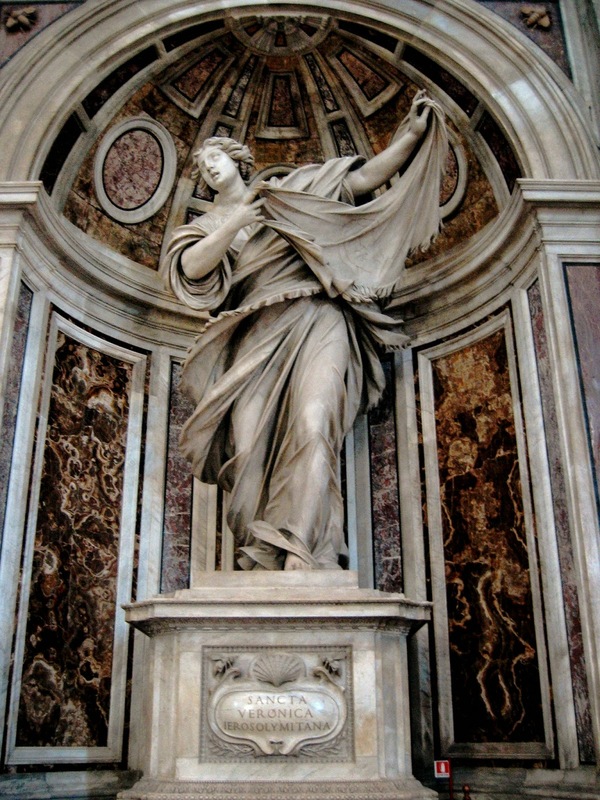 Although not recorded in the gospels, the Catholic church honors Saint Veronica with a feast day. She is also depicted in The Passion of The Christ. In bullfighting, the matador waves his cape in a move called Veronica, named for this pose. The scripture, above, is about the day we call Palm Sunday. It is the day of Jesus’ triumphal entry into Jerusalem. It was the first day in a very long week — the most important week in the Christian faith. Our Holy Week ends with a celebration of the resurrection on Easter Sunday. Scripturally, the week of the Passion happened during the observance of Passover. In 325AD at the Council of Nicea, Emperor Constantine separated Easter from Passover, to avoid confusion with the Jewish religion, and placed the holiday on Sunday. Eastern Orthodox churches did not choose the same method of calculating dates. Although they continue to call it Pascha (Passover), it is not always the same as the modern Jewish celebration or the same day as the Easter we celebrate in the West. Scholars can’t even agree on the day of the crucifixion, with Wednesday being the leading candidate, but none of that really matters. The important thing about Holy Week is the Resurrection of Christ. Jesus is given His cross. Jesus falls down for the first time. Simon of Cyrene is forced to carry the cross. Veronica wipes blood off of Jesus’ face. Jesus falls down for the second time. Jesus falls down for the third time. Jesus is nailed to the cross – the Crucifixion. Jesus’ body is removed from the cross – the Deposition or Lamentation. Jesus’ body is placed in the tomb. 9 of the 14 stations are marked today along the Via Dolorosa. The remaining stations are commemorated in the Church of the Holy Sepulchre. Stations 3, 4, 6, 7, and 9 are not specifically biblical and, as a result, Pope John Paul II introduced a new Scriptural Stations of the Cross in 1991. In the Scriptural version, each station is given a scriptural reference for believers to use as they reflect, or meditate, on the last hours of Christ’s passion. I didn’t give you the whole liturgy associated with each observance, just the station and scripture. When followed in the Catholic church, the priest begins with a prayer then the congregation says “Lord Jesus, help us walk in your steps,” after each station. There are some variations among protestants. One “alternate” version begins with the Last Supper and Ends with the empty tomb. I like this alternative version because we are resurrection people. As a religion, I do not think Christianity would have survived without the truth of Christ’s empty tomb. As you go through your Holy Week, take some time to reflect on the stations as you pray.